ROSS, Sir JAMES CLARK, explorer; b. 15 April 1800, possibly in Scotland, third son of George Ross and Christian Clark; d. 3 April 1862 in Aylesbury, England. 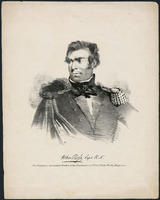 James Clark Ross’ father, a London businessman, came from an eminent Wigtownshire family and was an older brother of Sir John Ross*, the distinguished Arctic explorer. James’ early life came under his uncle’s influence. Ten days before his 12th birthday he followed Commander John Ross, then a dashing young officer serving in the Napoleonic wars, into the Royal Navy and thus found his life-long career. He began as a first-class volunteer on Briseis, but obviously John, who was well connected in the navy, looked after his nephew’s welfare, for he received quick promotions to midshipman and master’s mate on the same vessel. Ross served continuously for six years with his uncle, and moved with him when the latter took command of Actaeon for service in the Baltic, the White Sea, and the English Channel, and then of Driver for service on the west coast of Scotland. It was while he was on Driver that John Ross was invited on 11 Dec. 1817 by his friend Sir George Hope, first lord of the Admiralty, to take command of an Arctic expedition to search for a northwest passage from Baffin Bay to Bering Strait. This invitation changed the lives of both Rosses; they were no longer typical career officers but polar explorers. 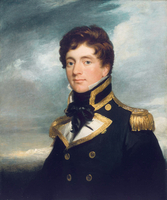 James Clark Ross, at 18, thus gained his first Arctic experience as a midshipman serving with his uncle in the 1818 search. The expedition’s two ships Isabella and Alexander sailed from the Thames in April, with John Ross’ second-in-command being Lieutenant William Edward Parry*, captain of the latter vessel. The well-equipped expedition was to enter Davis Strait, make observations on the currents, and sail north and west as far as the ice would allow. After taking his ships up the west Greenland coast, John Ross penetrated to the head of Baffin Bay. He observed the entrance of Smith Sound and, turning down the western shore of the bay, also saw the entrance of Jones Sound. Neither had been seen since William Baffin* named them; both were ice filled and Ross considered them dead ends. When the ships arrived off Lancaster Sound, however, the passage was clear and he sailed west until he seemed to see a range of mountains (he named them Croker’s Mountains) blocking his way. He turned back and by mid November the Isabella and Alexander were once more in the Thames. 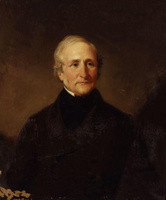 James C. Ross had taken an active part in the many scientific observations made on this voyage, working especially closely with Captain Edward Sabine*, a supernumerary. John Ross’ quick return was severely criticized and the controversy set off by his expedition lasted for years. Ross never commanded another government expedition. The Admiralty had nevertheless immediately fitted out two stout bomb vessels, the Hecla and Griper, for another expedition, to be commanded by Parry. James C. Ross received an appointment as midshipman in Hecla. The ships sailed in May 1819. After getting as far north as Sanderson’s Hope on the Greenland coast, Parry turned west and forced a passage to the mouth of Lancaster Sound. There was clear sailing westward and Croker’s Mountains proved to be a mirage. Coming to Prince Regent Inlet, which he named, Parry took time to push 120 miles down that waterway before continuing westward through Barrow Strait. Again James C. Ross was active making observations and Parry named one of the promontories of Melville Island Cape James Ross. The remarkable westward progress was halted at 112° 51’ and Parry turned back to an anchorage at Melville Island. The long cold winter of 1819–20 was enlivened by the publication of a shipboard paper called the North Georgia Gazette and Winter Chronicle and by a series of theatrical productions. In these Ross and the other young midshipmen usually played the female parts. In the spring Ross got his first taste of sledging when Melville Island was crossed and surveyed. As soon as the ships were free from the ice on 1 August the expedition set sail and by early November Parry was back in London. His was the most successful of all the early 19th century Arctic expeditions for he had sailed halfway through the northwest passage. James C. Ross had spent his first winter in the Arctic, and it was only a beginning. In May 1821 Ross accompanied Parry’s next expedition, in Hecla and Fury, westward through Hudson Bay, still as a midshipman. He took an especially active part in the land surveys on this expedition, which spent two winters, the first at Winter Island and the second at Igloolik Island near the eastern end of Fury and Hecla Strait. He also served as naturalist, collecting birds, mammals, marine life, and plants. During the second winter he collected the first recorded specimen of the beautiful Ross’s Gull. Fury and Hecla Strait was surveyed by land and Parry saw the opening at its western end into what is now called the Gulf of Boothia. 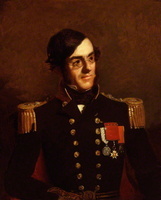 The expedition returned home in the fall of 1823 and Ross learned that he had been promoted lieutenant on 26 Dec. 1822. His efforts as a naturalist were rewarded by his election as a fellow of the Linnean Society. Parry’s third expedition, in 1824–25, with the same two ships, was a disaster. Ross sailed this time as 2nd lieutenant in the Fury commanded by Henry Parkyns Hoppner. Davis Strait was reached in mid July, but it took all summer to cross Baffin Bay to Lancaster Sound and enter Prince Regent Inlet; Parry wintered on its eastern shore. Parry was not well and he relied heavily on the hard-working Ross for much of the scientific work. Ross continued his taxidermy, tested the thickness of saltwater ice, recorded temperatures, made magnetic and lunar observations, checked longitudes, and went on land excursions. Summer freed the ships and Parry crossed over to the western side of the inlet. There, at the foot of an enormous precipice on Somerset Island, Fury was forced aground on 1 August at a place ever since called Fury Beach. Parry decided not to risk another winter in the Arctic with his crippled expedition; he was back in England on 12 Oct. 1825. James Ross had now spent every summer since 1818 in the Arctic and had wintered there four times. 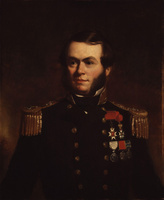 After enjoying a summer out of the Arctic, Ross was made second in command of Parry’s expedition to reach the North Pole. It was to reach the Pole by going north from Spitzbergen dragging boats on sledges over the ice in preparation for navigating the mythical “Open Polar Sea.” Hecla again was commissioned and sailed on 4 March 1827. On 21 June the boats left the ship and after a 100-mile sail the long journey over the ice began. It proved impossible. Not only were the trudging men plagued by wretched travelling conditions – fog, rain, and sun softened the snow so that pulling sledges loaded with 200 pounds per man was nearly impossible – but the ice was moving south under them. For every ten miles they laboriously dragged the sledges only four miles were gained. They never reached 83°. Parry became snowblind and Ross was severely injured when squeezed between a boat and an icy hummock. On 26 July, after finding they had gained only one mile in five days, Parry turned back. Their farthest north was a little beyond 82° 45′, a record that lasted until 1875 but still 500 miles from the North Pole. Parry left the ship when it reached the Orkneys and Ross brought her into the Thames on 6 October. 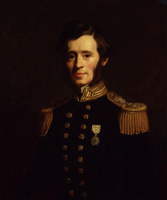 James Clark Ross was now the most active experienced officer in Arctic matters in the Royal Navy, Parry having retired to become the Admiralty’s hydrographer. Ross was a fine seaman, an authority on magnetism, and a good naturalist and taxidermist. He was rewarded with a commission as commander on 8 Nov. 1827, but without an appointment and on half pay. In 1829 he was still on half pay when his uncle Captain John Ross was preparing his privately financed expedition to attempt the northwest passage in the sidewheeler Victory. With a tender named the Krusenstern in tow, Victory sailed from Scotland on 13 June 1829. After an extended stop on the west coast of Greenland, Captain Ross crossed Baffin Bay and in August entered Lancaster Sound, then Prince Regent Inlet. The wreck of the Fury provided ample supplies of all kinds. By the end of September it was impossible to go any farther south and the Victory was laid up in an anchorage named Felix Harbour. During the winter James C. Ross made a series of sledge journeys exploring the shore, which proved that Boothia was a peninsula as the Inuit (Eskimos) had told them and not an island as John Ross had hoped. James crossed what is now called James Ross Strait, and discovered and named Matty Island and Cape Felix. His farthest westward was Victory Point where the coastline turned. This part of the coast he named King William Land assuming it was part of the mainland – actually he was on King William Island. Ice prevented the return of the Victory in the summer of 1830 and it was possible to move her only a few miles north of Felix Harbour, to an anchorage the party called Sheriff Harbour. Again she was roofed over and an observatory erected. The second winter’s routine was like the first, but John Ross discovered he could keep his men free from scurvy if they ate an Inuit diet: plenty of fat. As spring approached James C. Ross began his sledging journeys again. His objective was to locate the North Magnetic Pole, which he did at eight in the morning of 1 June 1831. He set up the British flag, took possession of the North Magnetic Pole and adjoining territory in the name of King William IV, and erected a cairn. The location was established as latitude 70° 5′ 17” north and longitude 96° 46′ 45” west (the pole has since moved farther north and west). Ross returned to the Victory on 13 June after an absence of 28 days. Again that summer the ship remained locked in the ice and could only be moved to another anchorage, named Victory Harbour (Victoria Harbour). During the interminable months of this third winter John Ross decided to abandon the ship as soon as the weather moderated, load boats and provisions on sledges, and go back to Fury Beach. James C. Ross was a tower of strength in this endeavour. The expedition was, however, forced to spend a fourth winter on Prince Regent Inlet. A lane of water finally opened up on 14 Aug. 1833, and on the 26th the expedition was picked up by a whaler in Baffin Bay. 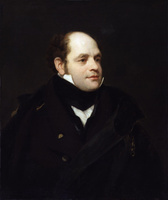 The Rosses, who had spent an unprecedented four and a half years in the Arctic, were received by William IV upon their return. 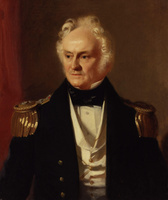 James C. Ross was assigned to Victory at Portsmouth and on 28 Oct. 1834 received his well-deserved promotion to post-captain. He was voted the thanks of the Common Council of London and presented with a piece of silver plate from the subscribers of the Arctic Land Expedition (one of the groups organizing to rescue the Rosses if they had not returned). 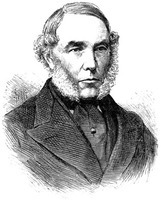 In 1835 James C. Ross was ordered, as one of Britain’s leading authorities on terrestrial magnetism, to conduct the first systematic magnetic survey of the British Isles. This survey lasted until 1838 but was interrupted in December 1835 when Ross was detached to take command of Cove to go to the relief of 11 whaling ships frozen in Davis Strait. He sailed in January 1836, but most of the whalers got back on their own before he returned to the survey in August. He had now spent eight winters and 15 navigation seasons in the Arctic regions, an unequalled record. He was offered a knighthood for his distinguished service, but for some reason refused it. His experience in ice-filled seas and his knowledge of terrestrial magnetism made him the logical choice for commander of an Antarctic expedition to study this magnetism in extreme southern latitudes; the voyage was strongly supported by the British Association for the Advancement of Science and the Royal Society of London. In two strong bomb vessels, Erebus and Terror, Ross sailed for the southern hemisphere in September 1839. 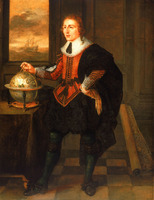 He spent the next three years there making geographical and magnetic observations and returning to Van Diemen’s Land (Tasmania) and Australia during the winter. He discovered Victoria Land, McMurdo Sound, the Ross Sea, and the great Ross Ice Barrier, and added many lesser features to the map. The successful expedition returned home in September 1843. Ross now accepted a knighthood and married Ann Coulman on 18 Oct. 1843 in Wadworth. During five years of private family life in Aylesbury Ross, although not a fluent writer, wrote A voyage of discovery and research in the southern and Antarctic regions during the years 1839–43, one of the most important books ever written on the Antarctic. When Ross married he had pledged himself not to take any further polar voyages. His wife released him, however, in 1848, when he was asked to command the first expedition to search for Sir John Franklin*. He sailed on this errand of mercy on 12 May 1848, in command of Enterprise and Investigator. Among his officers were two men who would become leaders in the next generation of Arctic explorers: Robert John LeMesurier McClure*, who later proved the existence of the northwest passage, and Francis Leopold McClintock*, who eventually found the remains of the Franklin expedition. Ross searched north into Wellington Channel and wintered his ships (his ninth and last winter in the Arctic) in Leopold Harbour at the northeast corner of Somerset Island. From here he surveyed the shores of Peel Sound, but found no trace of Franklin. During the summer his ships were carried out into Baffin Bay and in September were released from the ice. They were paid off at Woolwich on 26 November 1849. Although he had surveyed another 150 miles of unknown coast, the expedition failed in its main purpose. Ross now lived quietly, enjoying the company of his wife and four children in Aylesbury. In 1856 he was made a rear-admiral. The next year Lady Ross died and Sir James never recovered from the shock. J. C. Ross, “On the position of the North Magnetic Pole,” Royal Soc. of London, Philosophical Trans., CXXIV (1834), 47–52; A voyage of discovery and research in the southern and Antarctic regions during the years 1839–43 (2v., London, 1847). John Ross, Narrative of a second voyage in search of a north-west passage, and of a residence in the Arctic regions during the years 1829, 1830, 1831, 1832, 1833 . . . including the reports of Commander . . . J. C. Ross, and the discovery of the Northern Magnetic Pole (1st ed., London, ; 2nd ed., 1835); A voyage of discovery, made under the orders of the Admiralty, in his majesty’s ships Isabella and Alexander, for the purpose of exploring Baffin’s Bay, and inquiring into the probability of a north-west passage (London, 1819). DNB. E. S. Dodge, The polar Rosses: John and James Clark Ross and their explorations (London, 1973). Ernest S. Dodge, “ROSS, Sir JAMES CLARK,” in Dictionary of Canadian Biography, vol. 9, University of Toronto/Université Laval, 2003–, accessed April 24, 2019, http://www.biographi.ca/en/bio/ross_james_clark_9E.html.